This beautiful new bridge provides access for bicyclists and pedestrians between the San Dieguito River Park Trails and the Rancho Bernardo Community Park. As you drive across Lake Hodges on Interstate-15 and look at all the freeway construction, you may notice another bridge going up about 1000 feet west of the freeway. This is the new Lake Hodges Bicycle/Pedestrian Bridge that is expected to be in operation by this time next year. The 990 foot long bridge is located approximately 1000 feet west of I-15 crossing Lake Hodges. For bicyclists and pedestrians, the new bridge will provide access across Lake Hodges between Rancho Bernardo and South Escondido. For enthusiasts of the trails around Lake Hodges, this will be a connection between the River Park trails on the north side of the lake and the Rancho Bernardo Community Park on West Bernardo Drive. For bicycle commuters, this will be a new way to cross Lake Hodges without being on the freeway. The bridge will have an innovative stress ribbon design to enable a long span with only two piers. This will be visually and aesthetically pleasing across this scenic area. All the extra piers you currently see are only temporary during construction. This view is approaching the new bridge (and the freeway in the background) from the Rancho Bernardo Community Park on West Bernardo Drive. 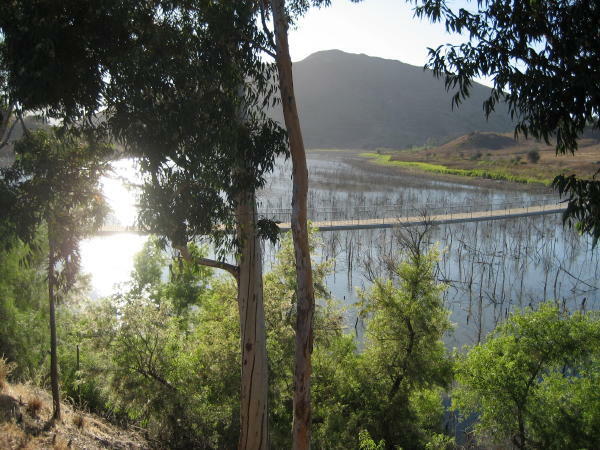 Lake Hodges and the San Dieguito River Park are in an environmentally sensitive area. 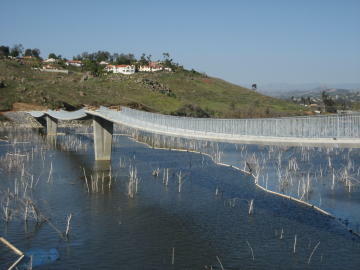 This is a habitat area and work on the bridge was suspended during the nesting season. This is the bicycle and pedestrian pathway on another new bridge that now carries traffic across I-15, connecting West Bernardo Drive on the west with Pomerado and Highland Valley Roads on the east. This bridge was completely demolished and rebuilt as part of the I-15 Managed Lanes Project by Caltrans. This will provide easy access to the River Park Trails from the east side of Rancho Bernardo and Poway. Looking down from the new Pomerado Road / West Bernardo Drive bridge over I-15 (looking across Lake Hodges towards Escondido) you can see the new southbound lanes on I-15 that are currently under construction. Looking west across the new Lake Hodges Bicycle/Pedestrian Bridge, it is easy to appreciate the scenic beauty of Lake Hodges and the San Dieguito River Park. This view shows how close the Lake Hodges Bicycle/Pedestrian Bridge is to the Interstate-15 freeway where it crosses the lake. On March 10, 2009, the new bridge is nearing completion. The temporary construction trestles have been removed, and the new railings have been installed. More information about the Lake Hodges Bicycle/Pedestrian Bridge is available at the following website links. For more information about the Lake Hodges Bridge, or for other information about San Diego and the communities around Rancho Bernardo, including housing opportunities, please call me, George Cooke at (858) 674-1222.